Fall is the time to sow many spring-flowering seeds and bulbs, as well as cover crops to enrich the soil. I love that in recent years we’ve really broken away from the old idea that the gardening season ends in late summer. Not only can we continue planting a variety of plants so long as the ground is soft, but there’s lots of food crops that will survive throughout the winter months with just a few protective measures. And, of course, it’s the best time of year to plant cold-loving bulbs for spring flowers. Here’s 7 ideas for things to plant in the fall garden. Timing depends on your location and how long you have before first frost (if you get frost!) but this list should give you some ideas. Always consult local seed and bulb sellers to find the best choices (and timing) for your area. I’ve divided these suggestions into two groups: bulbs and seeds. Now is the time! Garlic does best when planted in the fall, enjoying a good winter chill, before maturing for harvest in the summer. You’ll want to get the garlic bulbs in the ground while the weather is cool (not warm or freezing). They’ll establish roots and be ready to multiply in the new year. This one is just for those of you in warmer climates with fairly mild winters: plant onions now. Find a local seller to learn which varieties do best in your area. Fall-planted onions have a unique sweetness that makes this task totally worthwhile. Now is the time to plant cold-loving flowering bulbs both in the ground and containers. 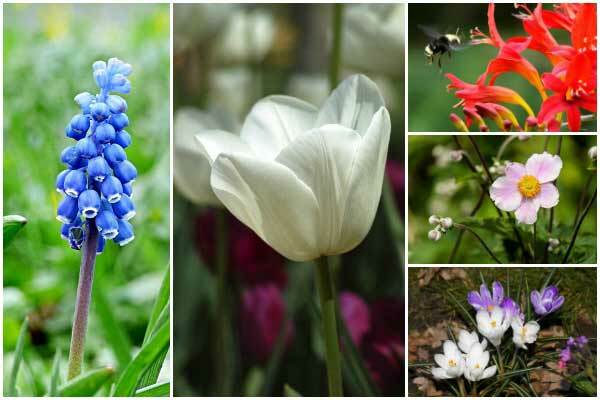 Flowering bulb choices include tulips, daffodils, hyacinth, crocus, Dutch iris, scilla, and more. Because I have so many squirrels in my garden, my preference is to plant them in containers and keep them protected from tiny, furry hands. In general, you want 16 to 18 weeks of cool temperatures before blooming time. After a long winter, there is nothing quite as sweet as a container spilling over with gorgeous tulip flowers. If you can provide some protection with a cold frame, cloches, raised beds with covers, or frost covers, you can start salad seeds now and enjoy fresh greens over the winter. Best sown in spring or fall (not hotter months), you can plant some radishes now if you’ve got a few weeks before first frost. If the colder weather comes sooner than expected, just have frost covers ready to protect your darlings. Radishes are a fun crop to grow with kids because they’re super fast from seed to table. There’s a simple trick for starting delphinium seeds in the fall (they like it!). And there’s over 30 types of flower seeds that benefit from cold weather sowing. What is green manure? I know, it doesn’t sound so pleasant but there’s really nothing manure-ish about it…. Green manure is the nickname for crops used to enrich the soil. Farmers grow green manure crops in the winter for two purposes. 1. It keeps precious top soil from blowing away (which happens when soil is bare). 2. The cover crops are blended into the soil to add nutrients before spring crops are planted. You can do the same thing with your home garden beds. Green manure crop suggestions include alfalfa, red clover, and winter rye. If your garden beds have provided a lot of produce, feed your depleted soil with a winter cover crop.